This technical article explains how to calculate and draw a single line diagram of the three-phase, 60-Hz system power system with generators, motors, transformers and lines. The system described in the problem is shown in Figure 2. The oil circuit breakers are added at the appropriate points for proper isolation of equipment. It is the general procedure to use single line diagrams for representing three-phase systems. When analysis is done using symmetrical components, different diagrams may be drawn that will represent the electric circuitry for positive, negative, and zero-sequence components. Additionally, it is often necessary to identify the grounding connection, or whether the device is wye- or delta-connected. This type of notation is shown in Figure 3. 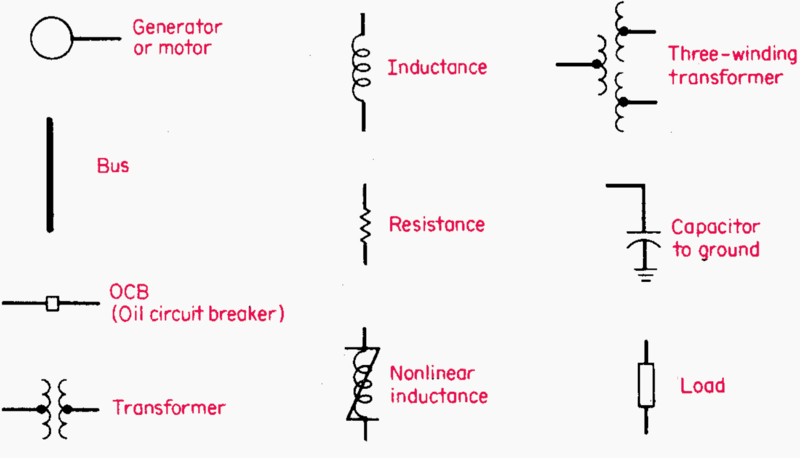 Figure 3 – Identification for wye-connected generator or motor. (a) Solidly grounded. (b) Grounded through an inductance. (c) The transformer is identified as being delta-wye, with the wye side solidly grounded. For the system shown in Figure 4, draw the electric circuit or reactance diagram, with all reactances marked in per-unit (p.u.) values, and find the generator terminal voltage assuming both motors operating at 12 kV, three-quarters load, and unity power factor. 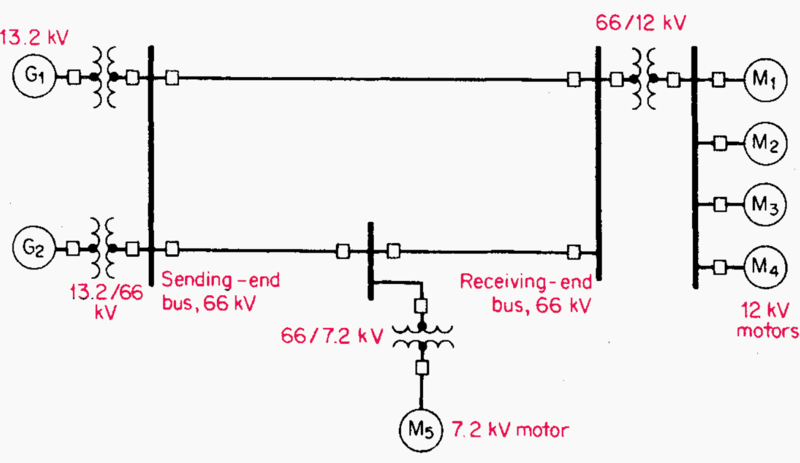 Figure 4 – Single line diagram of electric-power system supplying motor loads. Specifications are given in above table. By observation of the magnitude of the components in the system, a base value of apparent power S is chosen. It should be of the general magnitude of the components, and the choice is arbitrary. In this problem, 25,000 kVA is chosen as the base S, and simultaneously, at the generator end 13.8 kV is selected as a base voltage Vbase. The selected base S value remains constant throughout the system, but the base voltage is 13.8 kV at the generator and at the motors, and 72.136 kV on the transmission line. No calculation is necessary for correcting the value of the generator reactance because it is given as 0.15 p.u. (15 percent), based on 25,000 kVA and 13.8 kV. If a different S base were used in this problem, then a correction would be necessary as shown for the transmission line, electric motors, and power transformers. 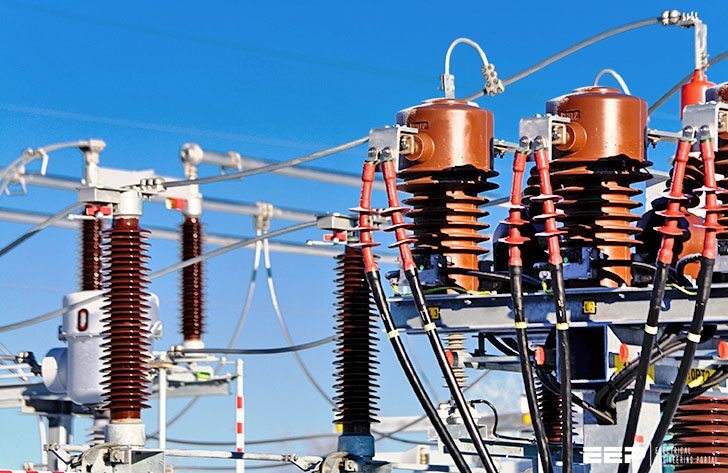 It is necessary to make a correction when the transformer nameplate reactance is used because the calculated operation is at a different voltage, 13.8 kV / 72.136 kV instead of 13.2 kV / 69 kV. (0.11) (25,000/25,000) (13.2/13.8)2 = 0.101 p.u. This applies to each transformer. Xper unit = (65) (25,000)/(1000)(72.1)2 = 0.313 p.u. Corrections need to be made in the nameplate ratings of both motors because of differences of ratings in kVA and kV as compared with those selected for calculations in this problem. Use the correcting equation from Step 3, above. X”A = (0.15 p.u.) (25,000 kVA / 15,000 kVA) (13.0 kV / 13.8 kV)2 = 0.222 p.u. X”B = (0.15 p.u. )(25,000 kVA /10,000 kVA)(13.0 kV / 13.8 kV)2 = 0.333 p.u. If the motors are operating at 12 kV, this represents 12 kV/13.8 kV = 0.87 per-unit voltage. At unity power factor, the load is given as three-quarters or 0.75 p.u. Iper unit = per-unit power/per-unit voltage = 0.75/0.87 = 0.862 ∠0° p.u. VG = 0.87 + j0.444 = 0.977 ∠27.03° p.u. In the solution of these problems, the selection of base voltage and apparent power are arbitrary. However, the base voltage in each section of the circuit must be related in accordance with transformer turns ratios. Zbase = (base kV)2 (1000) / (base kVA). Thus the per-unit reactance of the transmission line equals (actual ohms) / (base ohms) = 65 / 208.1 = 0.313 p.u. On an electrical one line diagram what does Kva + and Kva* mean? Can you give me the Subtransient reactance Table of motors and generators? thanks! (0.11) (should be 0.15) (25,000/25,000) (13.2/13.8)2 = 0.101 p.u. should be 0.13724 p.u. •	Xper unit = (65) (25,000)/(1000)(72.1)2 = 0.313 p.u. Have you tried to search? I am just wondering on step 3 Calculate the Transformer Reactance why did you use 0.11 as the nameplate p.u. reactance?Where do we find this information on the details given for the components of the power system? In step 3 for the Transformer Reactance calcs, you should be using 0.15 pu as the starting reactance (per the table at the beginning), which would result in the new reactance of 0.13724. Great article. Hoping for some more of these. Congatulation for your work about single diagram . it’s simple and pratical very good.